The Love’s truck stop construction site on Wednesday. In the background, I-5. 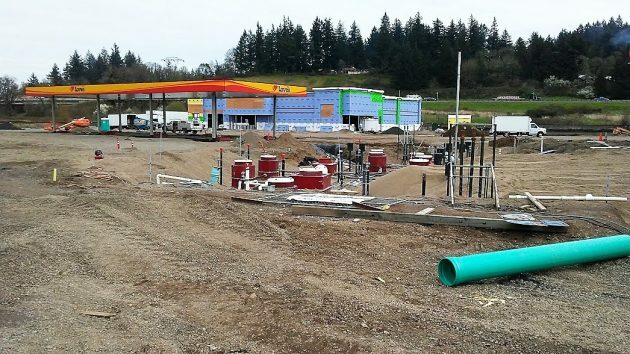 The big new Love’s truck stop on the north side of Millersburg is coming along, as passersby on Old Salem Road can readily see. I heard that it hopes to open on July 11, but I haven’t been able to confirm the date. Also under way: Construction of highway improvements on the nearby northbound exit and entrance ramps on I-5. ODOT required those changes as a condition of allowing the truck stop project to go ahead. The building permit on file at the Linn County Planning and Building Department summarizes the project: A Love’s Travel Stop with a main building of 9,260 square feet and a valuation on the permit of more tha $1.7 million; a canopy of 5,670 square feet covering the gas pumps with a valuation of about $489,000; a similar canopy for the diesel pumps of 4,000 square feet and valued at $344,800; and a 6,326-square-foot tire shop valued at about $545,000. Building permit valuations typically are based on square footage. Actual construction costs may be different. The main building, 24 feet tall, includes a convenience store and an Arby’s restaurant. The permit says the development will have parking spaces for 78 automobiles and an equal number of trucks. At Millersburg City Hall, Janelle Booth told me the Love’s company hopes construction will be completed in time for the place to open for business in the summer, though they had hoped to be finished sooner. She’s the city engineer and assistant city manager. I got the July 11 opening date from a worker at the site. Acording to our schedule July 11th is the day the GC will turn the store to the owners, to fill with merchandise and training, and the 25th will be the Grand opening.